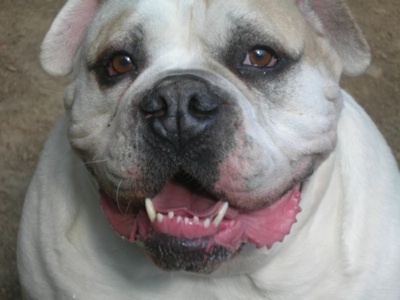 Mr. Belvedere is my other American Bulldog. He is mixed with Bull Mastiff, weighs about 104 pounds and is 4 years old. I was helping another rescue organization in Los Angeles and one night I received a telephone call asking if I could foster a dog. I had the room in my place and an extra room I designated as the “overnight (or sometimes longer) house guest” room. Besides, my own dogs were very dog friendly and welcomed any dog or cat into the house without getting territorial. I supposed they looked at it being a new playmate to tease. I agreed to foster “Barrot”. This was his name when I first knew of him. Barrot had been rescued from an abusive household where he was chained outside of a garage and was hit repeatedly with a baseball bat whenever he would bark. I know, is that not what dogs do…bark? This apparently had been going on for nearly a year before he was removed from this situation. I was to pick him up at a shelter where he had been for about a week or so. When I arrived to pick him up, he was very scared and confused, but came with me willingly. Back at home, he immediately got a bath and grooming (even brushed his teeth) and I had set up his room with food, water and a very comfy cozy dog bed and, of course, a small basket filled with toys and chew bones. He had been neutered earlier that morning, so he was a bit drowsy still. The night was good….not a sound from him unless I count the snoring and boy did he snore. I received another telephone call from the organization this time asking me if I could bring him to the pet adoption, which was being held in West Los Angeles the next day. I agreed and the next day I prepared him for his big debut. I just dropped him off and was to pick him back up in 3 hours if he had not been adopted. My fingers were crossed and he watched me leave. I returned to find him secluded from the rest of the group of dogs also up for adoption and the lady running the adoption told me he was not adoptable, because he fiercely barked at anyone who approached him and obviously would scare them away. She and I had a couple of words back and forth ending with me being told he was going to be “put down” for reason being he was too aggressive. I disagreed with her decision and she said I could take him and do what I wanted to, but I would have to sign a legal document with the local police department relieving her of any legal responsibilities. In other words, she did not want to be responsible if he bit someone. I signed all of the paperwork and brought him back to my house. For 3 weeks, I had a professional dog trainer come to my house and she, I and Barrot worked on his aggressive issues. It took no time at all for him to turn into the cream puff he is today. He stopped barking and growling at people and learned quickly to be well behaved. I changed his name shortly after to Mr. Belvedere, because Barrot was his old name…old life. He and Daisie Lou immediately had this bonding connection between them and to this day they still are “connected at the hip”. He sleeps right next to me at night taking half of my pillow and every now and then he snores right into my ear, so I have to move around a little bit. He experiences mild seizures occasionally. This is caused by being hit in the head so often. One of his eyes are a little off for the same reason. But, all in all, he is in excellent health and I do not know what I would do without my Mr. Belvedere. Also, I had no idea how handy and helpful Mr. Belvedere’s presence would be in the near future as I will explain in an upcoming blog in this series. Mr. Belvedere is such a great dog. When I look at him and see his goofiness, I still remember when they wanted me to put him down for aggression issues. They had written him off the list entirely and I just would not and did not accept this. Today, he plays with other dogs, children, adults, etc. without one sign of aggression. I cannot answer your question why people hurt animals. I know I cannot save them all and those I do not is extremely heartbreaking to say the least. The ones I do save replenishes my strength so I can continue my fight. I have to go the legislation route and hopefully get some more strict laws passed to “treat” the cause and not just the symptom. Btw… I have thoroughly enjoyed discovering and reading your blog. I look forward each time I see a new posting to read about your adventures. I just wanted to let you know that I think you are a Genuine Blogger. Celebrate your blog, as it is comes across to the reader as heartfelt and genuine. There are no rules with this honor. Accept it and relish in the thought that your blog is “award worthy” without having any strings attached. It is an award that I hope allows recipients to know that their work is appreciated, valued, and noteworthy by fellow bloggers and that does not have the pressure of “rules and requirements” to follow. It is to be received and valued as the gift and honor in which it is intended. You may post a bagde on your blog to display to others of this award you have won. If you choose to give this award to a deserving fellow blogger, please do so with no “rules.” Award it to someone for his or her genuineness in blogging. Free and clear. Here is the post that explains the reasoning behind this award: https://justramblinpier.wordpress.com/2011/05/20/genuine-recognition/ . Oh my goodness….I just do not know what to say. For starters, I will say thank you, thank you, thank you very much! I am a new blogger and was very nervous to start in the beginning. I was trying to find topics to write about, but nothing really came to mind I was passionate enough to put in a blog. Then one day I looked around at all of my dogs and was thinking how much every single one meant the world to me and I knew I had my topic. Never knew it was under my nose the entire time. I am so grateful that you find my writing to be genuine. I honestly just sit and write from my heart and it obviously shows according to your very nice compliment. I do not know if I could write about other topics with as much compassion, but I think I have enough animals and animal stories that will keep me blogging for quite a while. Again, thank you so very much for the award. I feel very honored to have received such a gem. Belvedere’s story is just an illustrative example of what potential and capacity to give affection and actually be non aggressive most dogs have when they themselves are given love, patience, and a chance to see that most people are actually good and not abusive. It’s a shame that Mr. Belvedere had such a rough start in life but being that his life and fate turned around so dramatically because of your caring and your seeing his potential to be such a loyal and affectionate companion, his life took a positive and happy turn instead of his continuing down a tragic path. People with caring hearts like yourself Ella make a difference, and change fates one life at a time. All your fine and caring qualities are manifested in the positive results that Belvedere and all the other dogs under your care have shown. People like you make the world a better place for your being in it. Deusimplicitus…..I am at a lost for words from your comment. Thank you very much for the many nice things you wrote. I know I am not “wonder woman” and it would be ridiculous if I thought I could “save” every abused, neglected and/or mistreated animals out there, but I have to say for every one I am fortunate to remove from horrible conditions, it is more rewarding to me knowing I was part of the reason that they have a safe and happy life now. Mr. Belvedere’s story was a special one for me for the reason he was spared death twice. Once if he had been left to be hit on the head with a bat and twice when they wanted to “put him down” for so-called aggressive behavior. I am proud, but not at all surprised, that I continued to stand my grounds and see the potential Mr. Belvedere had in becoming a great pet for someone. I never thought in the end that the someone would end up being me!! What a bonus!